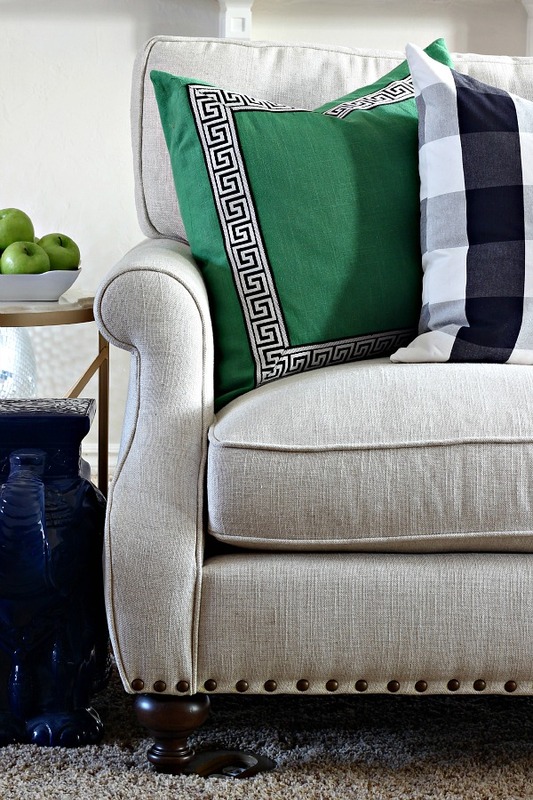 NEW SOFA AND LOVE SEAT FROM SCOUT & NIMBLE AND A REALLY GREAT GIVEAWAY! My Christmas came early... the new sofa and love seat from Scout & Nimble have arrived! 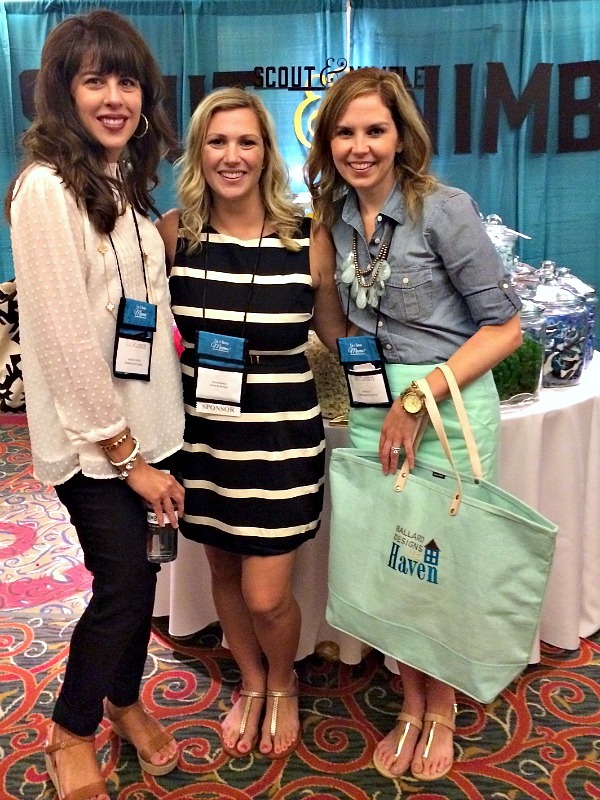 Working with Scout & Nimble was a dream. Honestly, as much as I love all things home, I did not really enjoy shopping for my furniture locally. Although S&N has a wide selection on their website, if you don't see what you might have in mind they are able to help with that as well. I gave them an idea of exactly what I was looking for and they took it from there. The team at S&N listened to what I wanted, sent me some options to begin looking through, answered questions that I had, guided me through a few decisions, and once I had made my selection completely took care of everything else. In just four weeks, my beautiful new furniture was delivered to my door, unwrapped, and put into place. After much debate, I opted for a neutral fabric. I think it will be the best choice for our family in the long run, and will still possibly use the navy velvet that I was considering on some side chairs in the future. We hope to add wood flooring in the room in the future, so that played into my decision as well. As much as I love the look of an English roll arm sofa, I really thought about how I use our furniture, and realized that I lean against the arm A LOT. The English roll arms are so low that I knew they wouldn't really work for me. However, I didn't want a bulky arm. I wanted my space to be taken up by seating area and not gobbled up by wide arm measurements. This style has been perfect. It's substantial enough to be supportive and comfortable, yet it's narrow and not obtrusive. And, I think the shape is super cute. 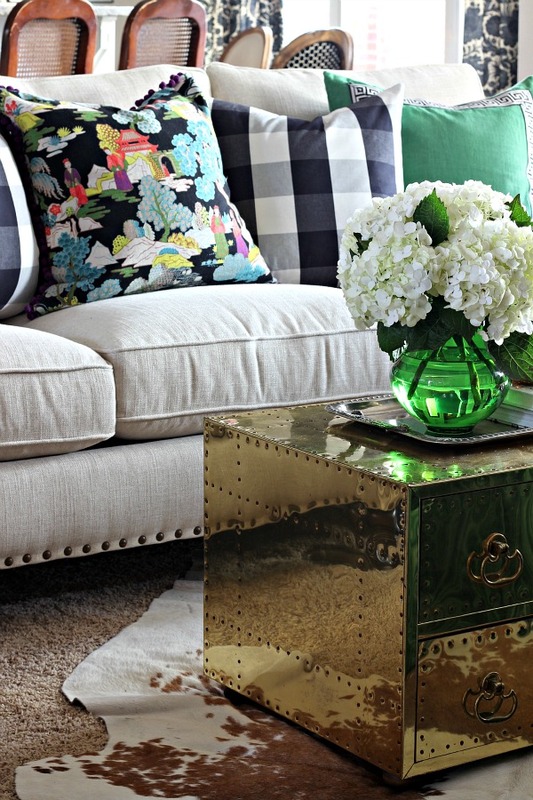 I was able to customize several things with my sofa, starting with the fabric. I previewed fabric swatches online, but then after narrowing down some options, Scout & Nimble sent swatches to me in the mail so I could see the true color and texture in my own home. The swatches came in handy too so I could do some stain testing on them to see what I thought would be the most durable for our family. Although they're not pictured here, I also was able to choose the fabric for the accent pillows. Lastly, I chose the color of the nailhead trim from several options, and the finish of the wood legs. The shading is dark in the photo, but it's a pretty medium wood color that is slightly distressed. I opted for a sofa and a love seat because while I would have loved to have two twin sofas, the measurements of our room would not accommodate that. 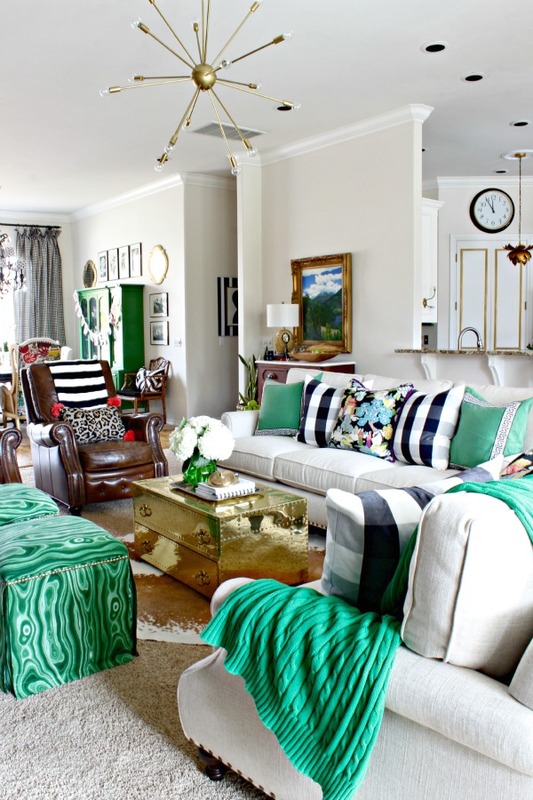 Also, while I love the thought of a sectional, I knew I would not want to be committed to the layout of a sectional. 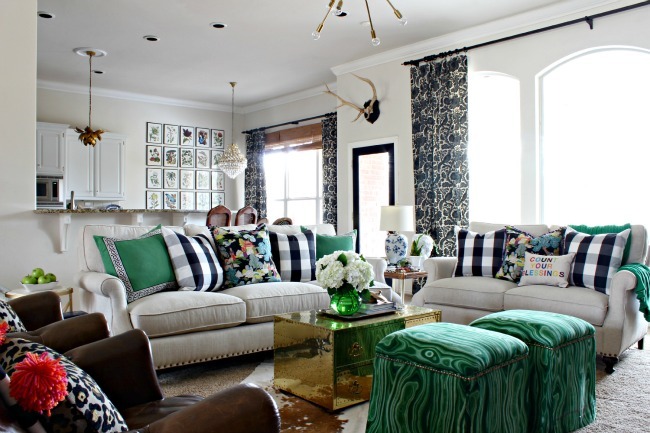 With this arrangement I have the feel of a sectional, but still have options if I want to move the furniture around. The sofa is almost a foot longer than my old one, and much deeper. I'm 5' 7", and I enjoyed stretching out on it the other night and realizing my head or feet didn't touch the ends! Little joys. ;) The love seat is also larger than our previous one, so the kids have enjoyed sprawling out on it. 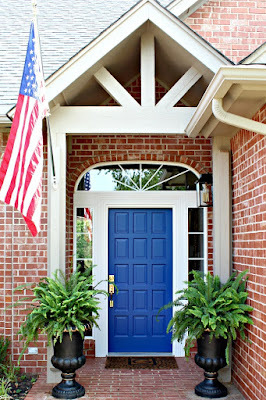 I know you'll want to keep an eye on Scout & Nimble and consider what they have to offer for your next home purchase. They are launching a new program called "Behind the Bookcase" with exclusive offers just for those who sign up. These discounts are not publicized or available anywhere else online. Join by subscribing to their email list, and get ready for your own secret deals! 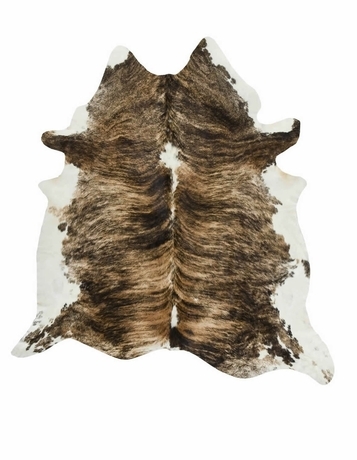 To celebrate, Scout & Nimble is offering one of my readers this GORGEOUS cowhide rug! It's a very generous size, approximately 72" x 90". You guys, this rug is valued at $519... it's a good one!!! I have 2 hides in my own home, one layered over carpet, and I love how they add interest and texture to each room they're in. They feel pretty good on bare feet, too! To enter, use the rafflecopter below. Click the link given in each set of instructions to follow, then submit your entry in each option given. Giveaway will run for a week, and the winner will be announced next Friday. I gave you 8 entry options, so choose as many or as few as you wish! *Edited: The D&T Instagram entry is not working properly. If you wish to use that option, click here to follow me, and then fill in your user name on the rafflecopter entry. That will work! 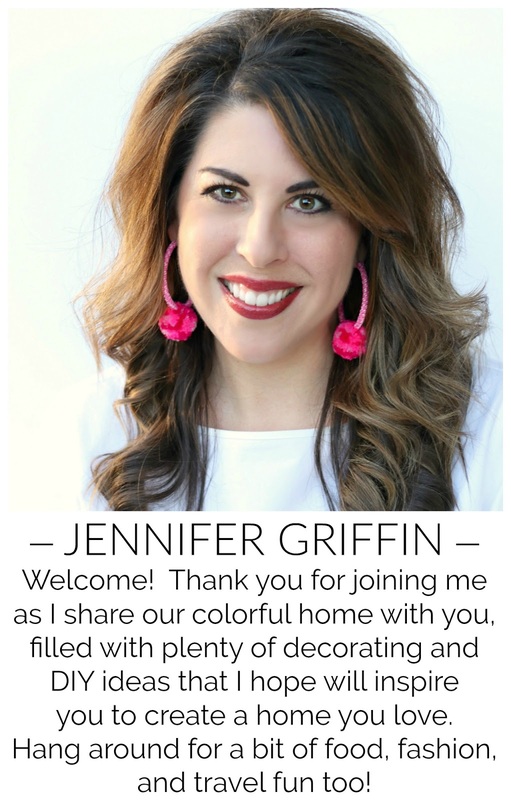 See you tomorrow for my Christmas Tour as part of the Blogger Stylin' Home Tours this week! Jennifer - the couches look gorgeous!! 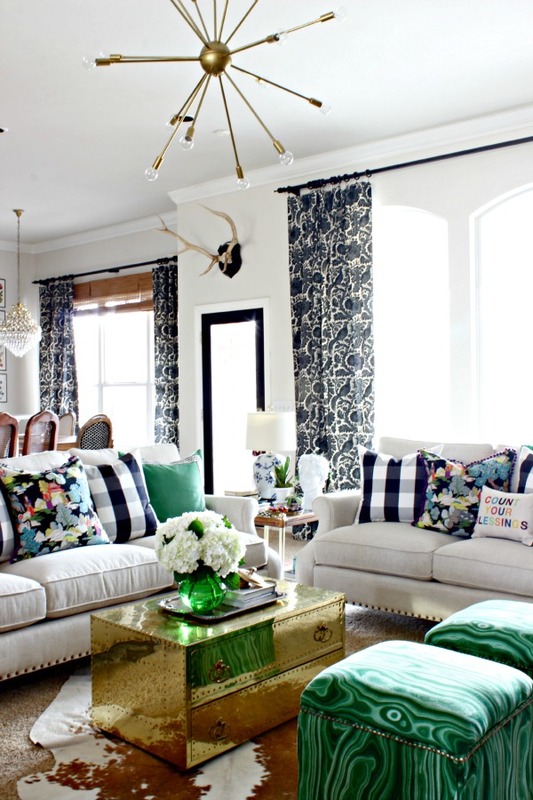 Your whole living room is just stunning! Love Jesse and all her Scout and Nimble goodies! 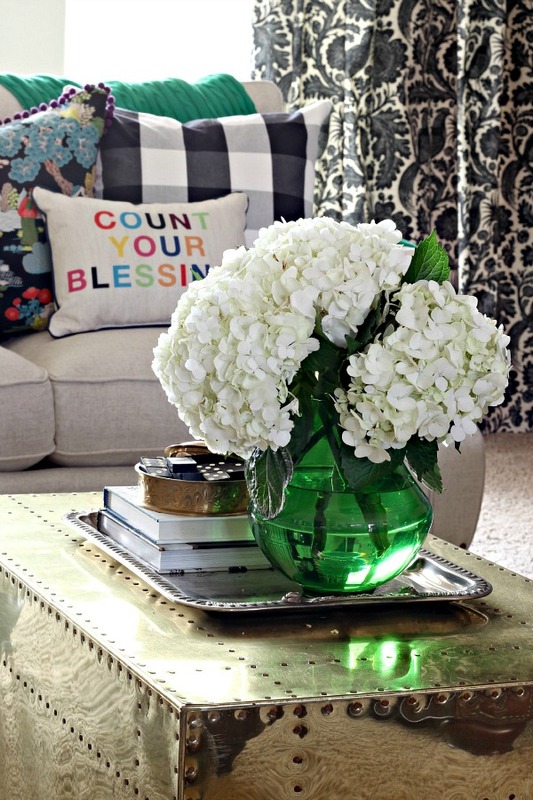 I love the couch and loveseat and your color choice is fabulous. I wish I could go with a light neutral like that but with 4 males and 4 dogs living under one roof that would be a stain nightmare waiting to happen. The sofas look spectacular! Very classic. I was so surprised though and thought for sure you were going to go with the navy sofa. Wow. You arranged your room so nicely. I am really touched by this arranged. Even I a wanna try this at my home. 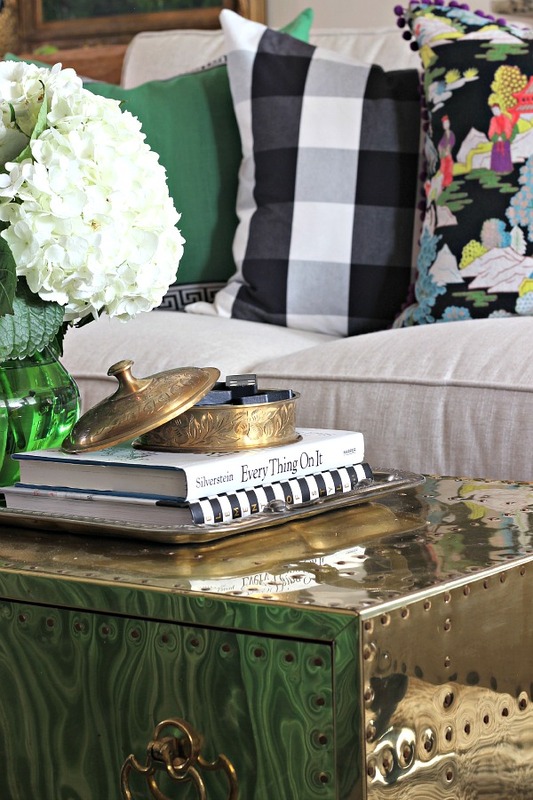 Jennifer, your sofas are beautiful! Would you be able to share the brand of the sofa? They no longer seem to be available on Scout & Nimble. Thank you.